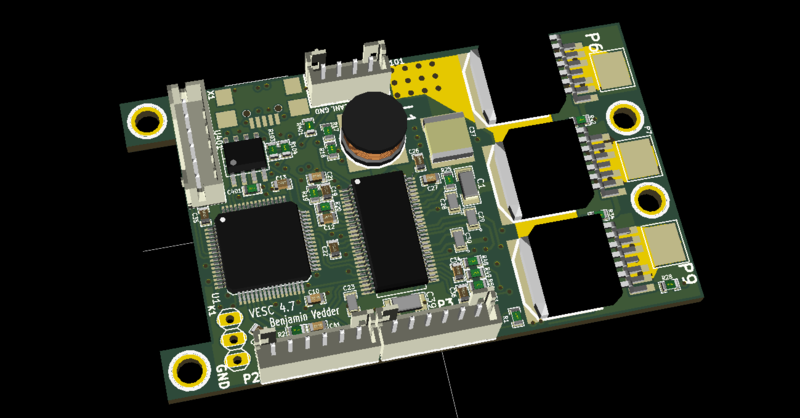 The PCB is designed using KiCad. Have a look at the links under the Resources heading at the top of this page to find all files. Currently I have no assembled PCBs or kits to sell, but you can order bare PCBs from hackvana with these gerber files. Since hackvana got so many orders for my ESC, Mitch wrote a wiki page about how to order VESC boards from him. That makes it super easy to order the PCBs from him. The components in the BOM can be ordered from mouser.com. Mouser numbers are included in the BOM as well. Make sure to order a bit extra of small capacitors and resistors in case you drop some of them and since the price doesn’t change much at all. Last I ordered, ordering 10 MOSFETs was cheaper than ordering 6 because there is a price break at 10, so have a look at the price breaks as well. Remember to put an electrolytic capacitor close to the ESC on the supply cable. How large it has to be depends on the length and inductance of the battery cables, but I usually use a 2200uF 63V capacitor. This is the best tutorial I have seen so far. It really is as easy as it looks when done right. Flux is essential. Without flux, it won’t work. I use a flux pen. Lead-free solder is no good. It has more poisonous flux, requires more heat, gives lower quality and is difficult to handle. Don’t use lead-free solder. Use a flat, screwdriver-shaped tip. Don’t use a cone tip, because putting solder on the top of it is almost impossible. If you get bridges between smd pins, removing them is easy with a soldering wick. Make sure to get the alignment right for the microcontroller when soldering the first corner. If you solder multiple corners and the chip is misaligned, you have to use hot air and remove it, then clean the pads and start over. I just put solder on the pad and use a hot air soldering station. Again, using leaded solder makes it easier. When soldering the DRV8302, I first solder the pad using hot air and then I solder the pins with a soldering iron. Notice that the pad under the DRV8302 must be connected for it to work, since it is the ground connection. VESC Hardware by Benjamin Vedder is licensed under a Creative Commons Attribution-ShareAlike 4.0 International License. This a brief tutorial on how to get everything running using a fresh install of Ubuntu 14.04. Here is a video where I do everything live to demonstrate that it isn’t that difficult. Please read all the instructions carefully to avoid most problems. Log out and log back in. You should now be ready to compile the firmware, upload the firmware, compile BLDC Tool and run BLDC tool. Note: before running the make upload command, you should open conf_general.h and select which hardware version you are using. It is printed on the PCB. Also, 2015-01-22 I changed the voltage divider resistors to allow up to 60V to be measured by the ADC, so in that case you also have to override VIN_R1 to 39000.0 in conf_general.h. With the bootloader, BLDC Tool can be used to upgrade the firmware later. Connect the ESC to the USB port of your computer and click “Connect” in BLDC Tool. The lower right corner should now say “Connected”. If you have gotten this far, you should be ready to connect a motor and configure the ESC from BLDC Tool. BLDC Tool can also be started by going to the bldc-tool directory with a file browser and double-clicking on “BLDC_Tool”. Note: Updating the firmware will delete the configuration of the ESC. To save it from BLDC Tool, use the “Read configuration” button and then “Save XML”. After updating the firmware, you can restore it with “Load XML” and “Write configuration”. Now you have the latest version of the firmware and BLDC Tool. Remember to reconfigure the ESC after these changes. 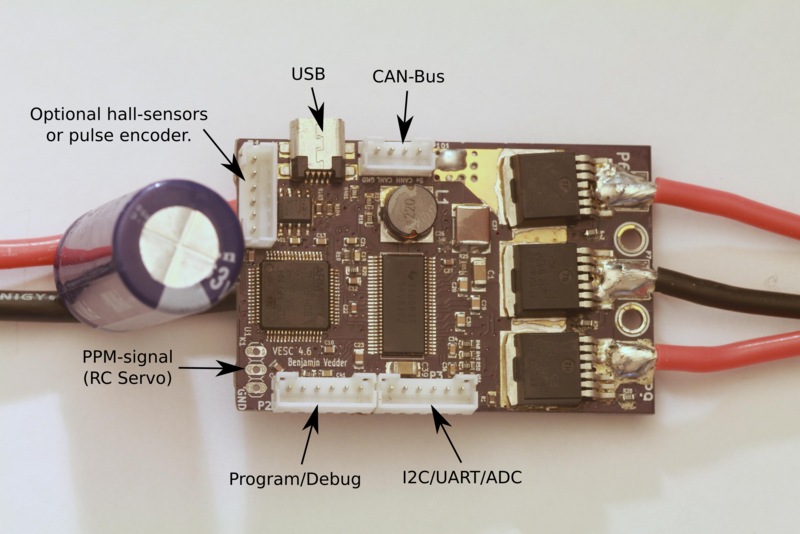 Note: During the configuration, it is assumed that the USB cable is connected to the ESC and that the lower right corner of BLDC Tool says “Connected”. The first thing to do in the “Motor Configuration” tab is to click “Read configuration” while the ESC is connected to get the current configuration. After that, click “Load XML” and look for a configuration that is the same as or similar to your motor in the “mc_configurations” folder included with BLDC Tool. If you find exactly your motor, you don’t have to change anything unless you want to tweak some parameters for your application. Note: Even if you load an XML configuration file, use “Read configuration” first anyway because the XML might not contain all parameters. The missing parameters will become blank and can mess with things. Soon I will make sure that sane default parameters are loaded, but I haven’t done that yet. Since this ESC uses uncommon techniques to commutate the motor in order to get good low-speed performance without sensors, it is important to set correct motor-dependent parameters in the sensor(less) tab. Otherwise, the motor will run poorly or not at all. Connect the motor without any load and make sure that it can spin up freely. Make sure that no other input such as PPM is used. If it is, it will stop the motor immediately when the detection tries to start it and the detection will fail. Click the “Start detection” button. The motor should spin up, release throttle and then run slowly for a moment. 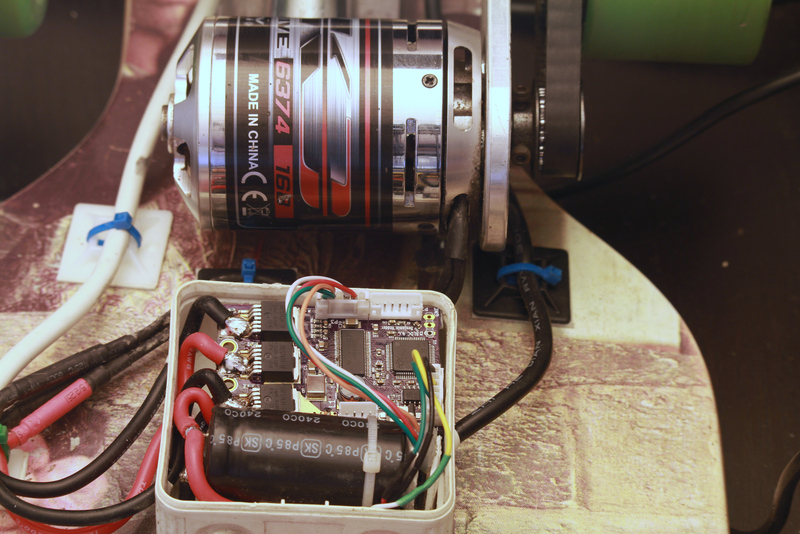 If the motor doesn’t spin up properly, Adjust “Current” and “Min ERPM” until it does. In general, small motors should have lower current and higher ERPM and larger motors the other way around. Current usually is in the range 1A to 6A and min ERPM usually is in the range 300 to 1200. If spinning up works but running slowly afterwards doesn’t (the motor just stutters), try increasing “Low duty” to 0.1 or so. Increasing low duty will make it easier for the motor to run slowly during the test, but the result will become less accurate. Manually put the obtained values into the boxes. I usually round “integrator limit” down to the closest multiple of 5 and “BEMF Coupling” down to the closest multiple of 50. Having them slightly lower than the detection result is good in most cases, so that’s why I round them downwards like that. Getting these parameters perfectly right is not too critical though. 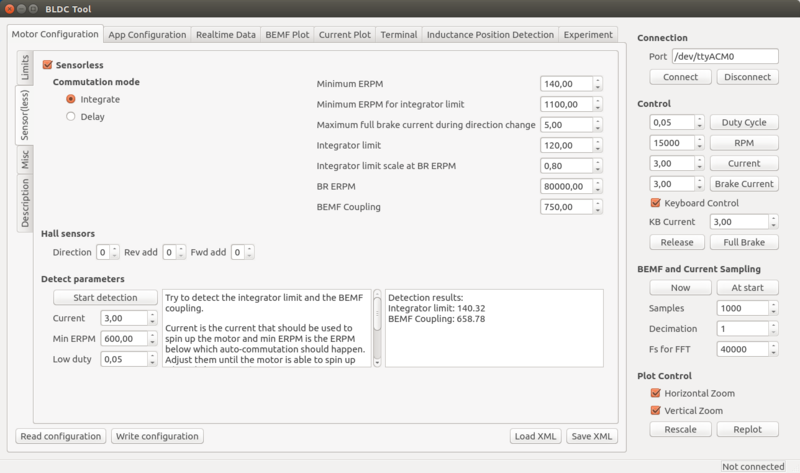 The next parameters to adjust are “Min ERPM” and “Min ERPM for integrator limit”. What they should be depends on the application and is in most cases not too important, but in general lowering them will work better if the load has much inertia. I have Min ERPM around 200 and Min ERPM for integrator limit around 1000 for all my applications. You can probably keep the same parameters I have, but if you want to tweak your startup you can experiment with them. It is important that “Min ERPM” always is lower than “Max ERPM at full brake” and “Max ERPM at full brake in current control mode” on the “Limits” page. Commutation mode should always be “Integrate”. The other parameters are for RPM-based timing advance and some other things that aren’t necessary to adjust in the normal case, so I won’t explain them here yet. For small low-inductance high-speed motors, the delay commutation mode can be used in case the integrate mode does not work. It does not require many parameters, just the minimum RPM which usually can be around 1500. I haven’t tested this mode much, but it is more or less how most hobby ESCs work (which is why it doesn’t require so many motor-specific parameters). Currently it does not support adjustable timing, but I will implement that in a few days since it is quite easy. To compensate for the current lagging behind the voltage at high speeds because of inductance or to get a bit higher top speed at the expense of some efficiency and torque, phase advance can be used. It is implemented in a speed-dependent way so that the motor gets more phase advance the faster it spins. It is implemented this way because having phase advance at low speeds does not give any improvements at all as far as I know, so the best way is to increase the effect as the motor increases its speed. BR ERPM is the electrical RPM of the motor at which the set phase advance is used, and Integrator limit scale at BR ERPM (will rename this option soon…) is the amount of phase advance to use. Setting it to 1.0 gives no phase advance and setting it to 0.0 gives 30 degrees (maximum) phase advance. The set phase advance will be mapped linearly between 0 ERPM and BR ERPM. If you don’t know what this is, you can leave the default options since it is not that important. 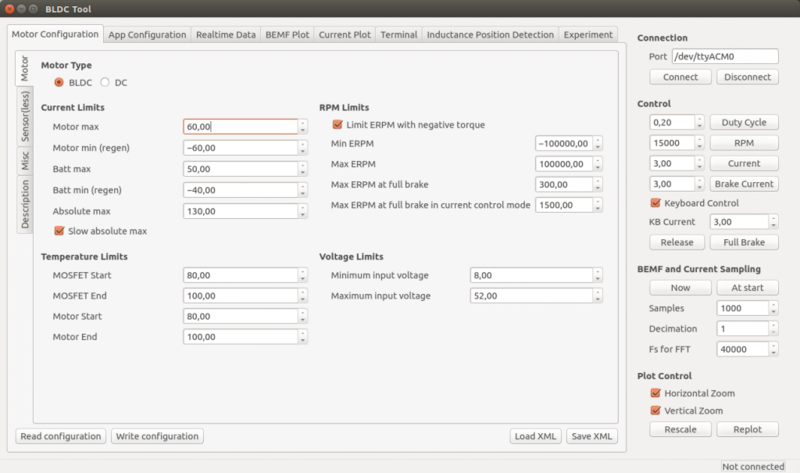 Current, temperature, RPM and voltage-limits can be configured depending on your application. Note: These limits are not foolproof. If you set them too high, you can damage the ESC and/or the motor. Separate limits for acceleration and braking current. Separate limits for motor and battery currents. “Absolute max” is checked in every PWM switching cycle and used in case the soft back-off strategy for the other limits doesn’t work. I usually set it way higher than the other limits because soft back-off is preferred rather than switching off the motor with a fault code, but it should never be higher than 150A. The “Slow absolute max” box will make sure that a filtered version of the maximum current limit is used. This is useful if there is much noise and that fault code kicks in all the time. I usually have it ticked. At the “Start” temperature, the current will become more and more limited linearly until the “End” temperature, where the output is switched off completely. Setting them about 20 degrees apart will make the ESC slowly decrease the maximum output current as it gets too warm instead of abruptly switching everything off. MOSFET temps (on the ESC) are implemented and working, but motor temps are not implemented yet. They will require an external temperature sensor in the motor. 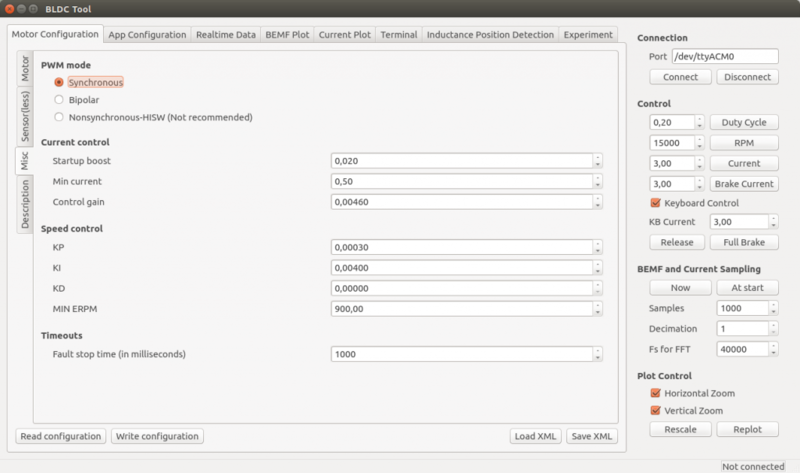 The software implementation is rather simple since I can just copy most of the MOSFET temperature limit code. Max and Min ERPM are hard RPM limits. It is preferable to use the soft application RPM limits instead if possible. “Max ERPM at full brake” (should change the name…) is the highest opposing RPM at which a direction change is allowed. Setting this too high will cause cogging when moving in one direction and giving high throttle in the other direction. On my longboard I have it at 300 and my RC car has it a bit higher. “Max ERPM at full brake in CC mode” is the highest RPM at which applying full brake by shorting all the motor windings is allowed. Setting this value too high can cause much mechanical stress in some circumstances. I have it at 1500 for all my applications. The minimum and maximum input voltage. 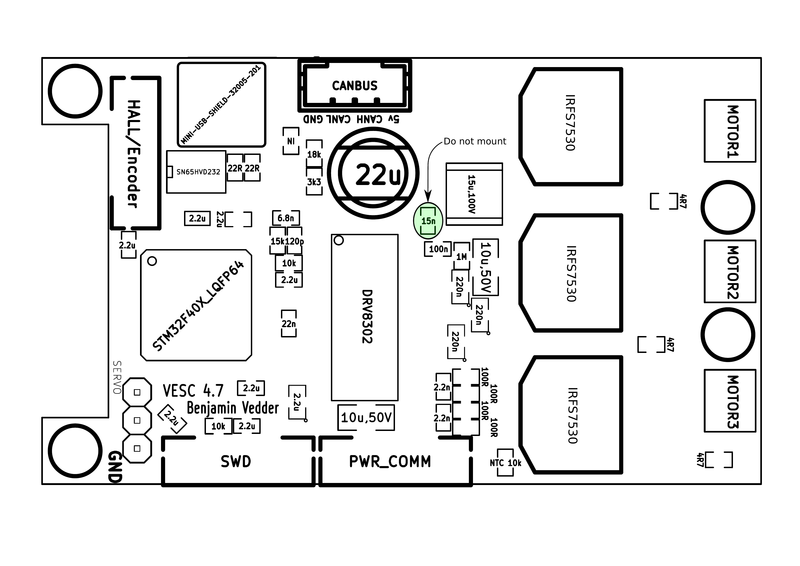 NOTE: I changed the voltage dividers in hardware 2015-01-22. If you have built the PCB before that, the maximum voltage can’t be more than 52V. The difference is whether the PCB has 33k or 39k resistors. 33k means that maximum 52V can be measured. The latest PCBs (with 39k resistors) can measure 60V, but you should have some margin on your supply voltage to be safe. You can of course replace all 33k resistors with 39k and measure up to 60V. Once the ESC is configured for your motor, you can use the up and down arrow keys to run the motor forwards or reverse in current control mote, or the right and left arrow keys to run the motor forwards and reverse in duty cycle mode. The buttons in the right-hand side of the GUI can also be used. Here are the rest of the motor configuration parameters. You probably want to experiment with Startup boost if you are using current control. The rest of the parameters can be left as their default values unless you have some specific reason to change them. Synchronous is recommended and the best choice for a majority of all motors. If you have some weird motor, Bipolar could work better, but it probably won’t. Nonsynchronous is only for experimentation and can kill the ESC if you are unlucky. Startup boost is the minimum duty cycle to use when using current control. If the motor is to weak when you are just starting, you can increase this parameter a bit until it feels right. The range is 0.0 to 1.0, where 1.0 is full throttle (which you shouldn’t use.). A sane range is up to 0.15 or so. Min current is the minimum allowed current. There should be no reason to change this, so leave it at the default value. Control gain is the gain used by the current controller. Increasing it makes the current response faster, but also increases the risk of getting an unstable system where the ESC can get damaged. Only change this if you know what you are doing. 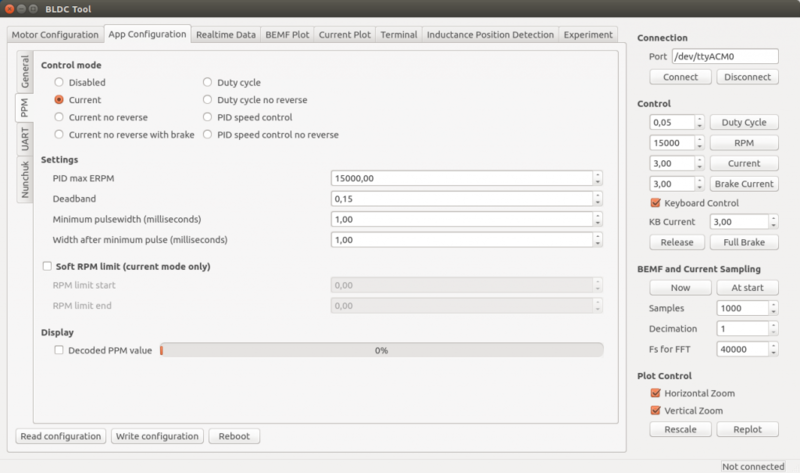 The PID parameters for the speed controller. Only change them if you know what you are doing. Fault stop time is the amount of milliseconds that the ESC should be completely switched of when a fault code arises. After that time, it will switch on and try to listen for commands again. First, click “Read configuration” to get the current configuration from the ESC. 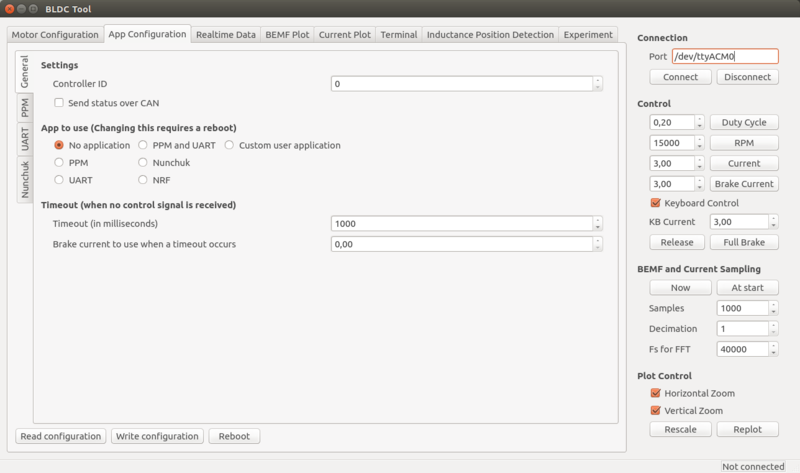 After that, select which application to use and configure that application. Controller ID is the ID of this VESC. If multiple VESCs are connected over CAN-bus, they must have different IDs. Send status over CAN has to be enabled to make other VESCs aware of this VESC and some of its current state. It should be enabled for all slave VESCs when connecting multiple VESCs over CAN-bus. Changing application requires a reboot. There is a button for that. After a reboot, you have to click connect again. Timeout is the amount of milliseconds after which the motor should be shut off in case the control signal is missing. “Brake current to use…” can be set to make the motor brake with a certain current when a timeout occurs instead of just releasing it. The signal that a normal RC receiver outputs is a PPM signal, so this can be used when connecting an RC receiver to the servo port. Disabled: Nothing at all, motor is off. Current: Torque control. This is what I prefer since it feels most natural. I haven’t seen hobby ESCs that have current control. Current no reverse: Save as above, but no reverse function. Note that centring the now will give half throttle. Current no reverse with brake: No reverse, but centre is zero torque. Reversing will brake, but not change motor direction. Duty cycle: Duty cycle or voltage control. What most hobby ESCs use. PID speed control: The throttle command is intepreted as a speed set command and closed-loop control is used to maintain that speed. “PID max ERPM” sets what max throttle should be interpreted as. Deadband: how much span in the centre of the throttle should be ignored. Minimum and maximum pulsewidth: The timing interpretation of the PPM signal can be adjusted in case your receiver doesn’t follow the specification or it you have some other reason to change it. Setting “Control mode” to “Disabled” and ticking display decoded PPM value is useful when adjusting these. Use Median Filter enables a filter that is very useful when there are glitches on the PPM signal. If you have a quadcopter application, you should disable the filter and make sure that there are no glitches since a filter introduces some delay. Speed limit that can be used in current control mode. Setting the start and end limits a bit apart will result in a soft torque decay when approaching the speed limit. Multiple ESCs over CAN can be enabled to connect several VESCs over CAN bus. All VESCs must have different Controller ID and the slave VESCs must have Send status over CAN enabled (see the general tab under app configuration). The slave VESCs don’t need to have any application enabled since they will just be listening for CAN commands. Traction control can also be enabled, which reduces the torque on motors that spin faster than the slowest motor proportional to their speed difference. To connect VESCs over CAN-bus, connect the CANH and CANL signals between them. DO NOT connect 5v and GND because that is likely to cause ground loops which can reset and/or kill the VESCs. The Nyko Kama wireless nunchuk can also be used to control the ESC. Note that not all nunchuks for the nintendo wii will work, because they slightly differently. Disabled or current control with or without reverse. If reverse is used, the Z button is used to toggle a direction change. Deadband: The span in the centre of the throttle that should be ignored. RPM limits: Limit the electrical RPM of the motor. The start value is the point where the torque should start decreasing and the end value is the point where the output will be switched off. Setting them slightly apart will give a soft RPM limit. Setting them very high will disable the RPM limit. 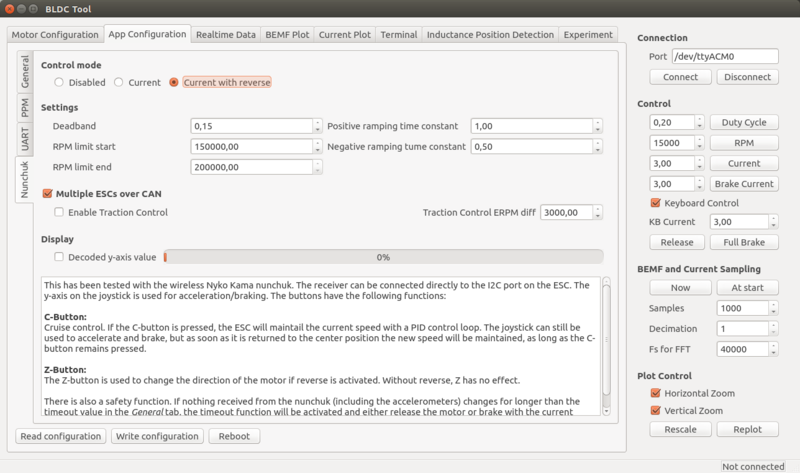 Ramping time constants: How fast the throttle command should be followed, in seconds. Use the “Realtime Data” tab to display realtime information from the ESC. Make sure that the “Activate sampling” box is checked. As I encounter different problems, I will put them here together with possible solutions for reference. Uploading the firmware does not work. Make sure that you have followed all steps in the tutorial, including adding udev rules to access the programmer without being root. Don’t use a too long cable for the SWD connector. Make sure that you have a working programmer. I got one from ebay that didn’t work at all and one that died quickly. Otherwise they have been reliable though. A DRV8302 fault code appears as soon as the motor starts. Make sure that R16 is not mounted (see the comment in the schematic). Connecting to VESC via BLDC Tool does not work. Run dmesg to see which ttyACMx port gets assigned to VESC when plugging in the mini-usb cable. Make sure that the mini-usb cable is plugged in and that power is connected to VESC. Connecting BLDC Tool is not done via the SWD programmer, but via the mini-usb port. If you are using a different usb-connector than the one from the BOM, make sure that the order of the pins is correct. The connector in the BOM is upside-down, so a connector that isn’t will have all the pins mirrored. My motor is not running properly. Make sure that you have configured VESC for your motor as described above. VESC is not plug-and-play and needs an individual configuration for each motor. Without the configuration, the motor will run poorly or not at all. Read the instructions carefully. Is there a way to “boost” the startup of my motor when using current control? Yes, the Startup boost option under Motor Configuration > Misc tab in BLDC Tool can be adjusted as described above. Update about this update: There are no assembled ESCs left. However, If you are interested in assembled VESCs you can still send me an email as described below so that I can put you on my extra list. If someone changes their mind or if there are other problems, I can send you VESCs that get left. I will update this information in the coming days, so make sure to check if there are updates. 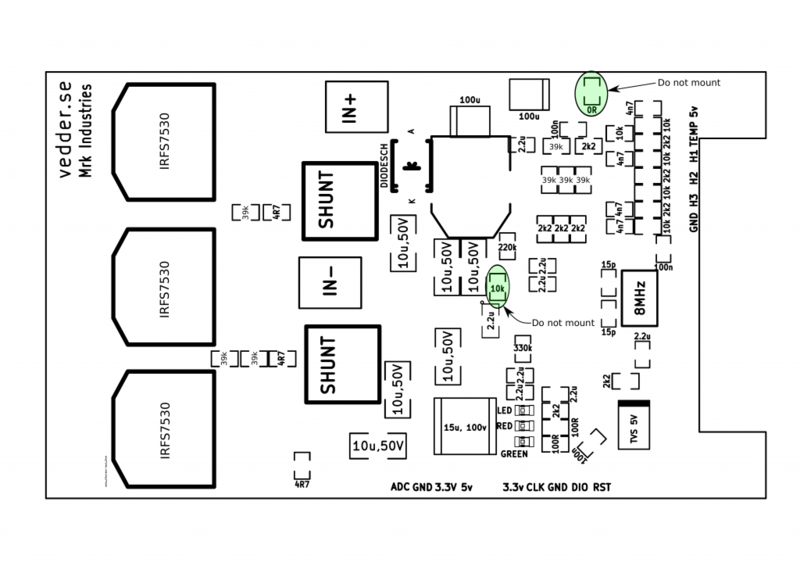 This entry was posted in Electronics/Hardware, Embedded Software, News/Announcements, Projects, Software and tagged ARM, ARM ESC, BLDC, ChibiOS, ESC, linux, longboard, open source, p_oshw, PCB, skateboard, STM32F4, tutorial, Ubuntu, USB-CDC, ws2811, ws2812 by Benjamin. Bookmark the permalink. Hello sir when i open the schematic file it asks me for BLDC_4-rescue and special library.. where can i found these? I am currently working on a brushless controler with a design similar to yours (STM32 and DRV8302) but with smaller transistor (20A/30V). In this topic you talk about adding inductor but in the last version of the controler you don’t use it so how did you fix the issue ??? Thanks in advance for your answer ! and congratulation for your work ! This was due to bad routing on one of my old PCBs. I thing the AVDD capacitor in the DRV had too long traces in my case, but there can be other things that cause the same problem. Have a close look at your routing. Rather than build, I planned to order one of your boards from one of the online vendors that has sprung up: enertion, ollin, jacobloy, etc. Can you confirm who you are actively receiving financial support from? I didn’t want to support a vendor that was not helping your efforts. Thanks again for the continued development of this project. Sorry for the late reply. From enertion I got a space cell once and ollin gives me a percentage for each board he sells. The best soldering and assembly quality I have seen is from ollin boards. He does a very good job with the assembly. what’s the intended purpose of the TVS Diode? It is to protect against voltage spikes on the 5V net. It has saved a few components for me already. Spikes from the switching regulator? Or do you connect a 5V supply from outside? Do you remember which components died when the TVS wasn’t there? Still the initial spin is very jerky and and smooth at all. Low RPM revolving is more or less OK when running the detection, but keyboard control is not able to turn the engine at all even if I set the detected settings. I am quite noob with this motor stuff and I have no good idea how to debug the settings. My question is that should it first of all work with such an engine since it is a bit different from standard hobby engine? Inertia of the rotor is also rather big since the rotor weights roughly 1.5 kg. 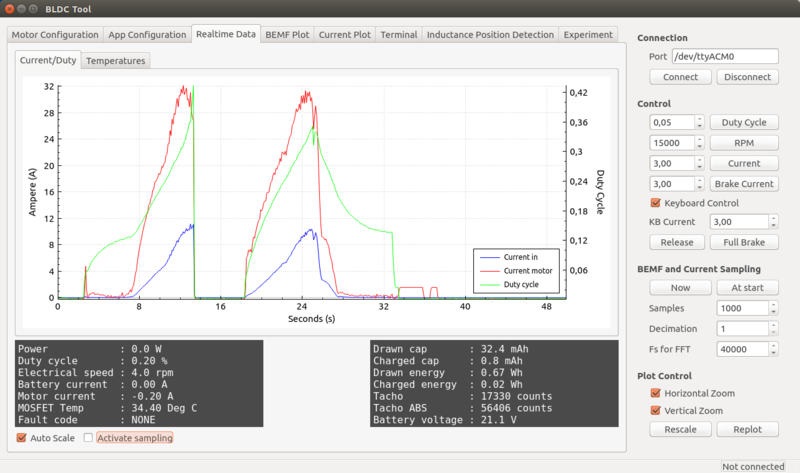 I was also wondering about the PID control parameters that is there any point changing those? And finally I noticed that the current firmware is 2.4 and the VESC that I have has 1.14 FW, are there any major changes in the latest one that might help me? Thanks for publishing this wonderful project. An integrator limit of 900 sounds very high, so that is most likely wrong. FW 2.4 is a huge update with full FOC support, so you can give that a try. 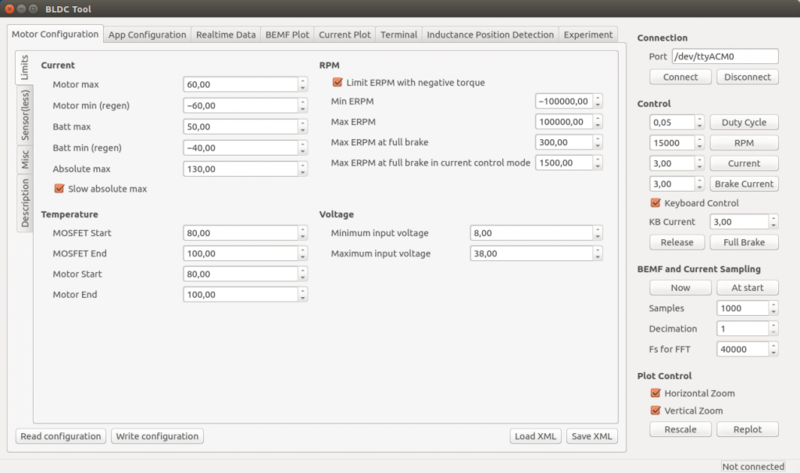 There is also auto-detection of all motor parameters. I will write more about that and make a video tutorial soon. Kari, I seem to be having a similar issue. How did you confirm that the VESC was outputting in three phases? I can’t figure out how your code works without it – maybe you don’t use the complementary pwm, or ? However, this seems to have no effect. Hi Benjamin, I have assembled some 4.10 PCBs , but the motor has no any respond in detection procedure, also the temperature figure shows 450c around. I think there are something wrong for hardware version. Can you please explain how to select hardware version in conf_general.h, thanks! I’m sorry Benjamin, forget it, the problem come from the temp resistor, the stupid supplier sent me wrong one. anyway, it’s working fine. Thank you! Hi Benjamin，i have read you code,but i have some question about that. how do you know the num?how to calculate it? Hello benjamin, i have a question. I can’t see any calibration configuration for the motors. What do you think about implemented in? First of all, this whole project is really amazing ! Its first purpose was to control your skateboard but you can basically do anything you want with it ^^. (commande introuvable in french means not found command or something equivalent in english). I actually solved the problem. The only thing I did was that I typed the “./configure” thing related to OpenOCD directly in the terminal and it worked ! i am using SWD discovery board and because of this error it not showing my motor connected..
please help me out with a possible way to overcome this error. will be waiting for your reply to the soonest.. If you have the st-link connected correctly you may want to check for bridged legs on the stm32 chip. The VESC should also give you a blue led when you connect the stlink/programmer. I’m also having this issue 🙁 Anyone got any idea whats wrong? Use shorter wiring on the programmer. I had the same issue using about 12″ wiring on the jst connector. Shortened it to 6″ and never had the problem again. can i use the VESC in PMSM motor? Do you have any problems with these observer in your FOC? I have a similar implementation, but it has a 180° uncertainty at zero rpm so it can start in both directions randomly. Or do you use a ramp for the startup? I’m trying to write a custom ADC app. I followed your instructions but got a make error ( (float)ADC_Value[ADC_IND_EXT]; undefined etc ). Should we use mc_interface.h rather than mcpwm.h? What are your long term plans for the VESC now that you’ve implemented FOC? Your project is absolutely fantastic! It can see that you’re in it had to spend a lot of time experimenting. – Do you think it would be possible to use Your VESC for a project similar to the Segway? I do not understand yet exactly all settings, but you can use VESC motor drive in both directions with break? – Have you tried VESC at some hub bike motor? – It would be possible to use OptiMOS IPT007N06N – in my opinion still has better specs (less resistance R (DS))? Thank you in advance for your response and I wish you every success in the further development. I’m trying to made a Segway with two VESC’s now. It has two 1,5 kW hub motors from e-bike, arduino mega 2560 with control algorithm and 12S 10,4 Ah LiPoly battery. I think that I get some valuable informations in a month, when I will make first tests. If you are still interested I can tell you then if it is possible to make a Segway with VESC’s. I finally got the debugging to work on the VESC. FYI, I used a SEGGER J-LINK PRO to make it work, but I still don’t get it with a STLINK-V2. Btw I have another problem. When I try to connect the board using the usb shield, I get no answer from the computer. I used both lsusb and dmesg but nothing seems to happen when I plug the usb in (I even tried on Windows and with another computer). How did you handle the USB connection in this project ? Did you have to set something in the ChibiOS configuration or during the STM32 initialization ? Or is it supposed to be “plug and play”, either you load the software on the board or not ? Hi Marcel, are you saying that, to debug the VESC (for example in eclipse and with on-chip-debugging) a normal STLINK-V2 does not work? I need to develop some code and debug it . I can see a coil inductor on your assembled pcb but I can’t seem to find one in the wiring diagram. What is it for and where is it in the diagramm? Thank you! It is mentioned in the BOM as Power Inductor – L1 (652-SDR0805-220ML). After hitting: “Start detection” the Motor “slapped” once hardly in one direction. After that the motor was dead. So not the motor was damaged but I thing something is damaged on the power site of the bldc. Processor etc. is still runniing. But the motor shows no reaction on bldc-tool control. Tried it also with another motor. No chance. Also a new firmware-update didn’t help. What hardware version did you build and did you upload the correct firmware for that version? If you uploaded the wrong firmware version onto v4.10/4.11 HW it is possible that you burned the trace next to R29 and burned your drv8302. A bit tricky really on a board because if the FETs are dead then probably burnt through like a fuse. Usually though only one top get and one bottom get are burned through – the others are ok. Sometimes they are cracked. You can measure the resistance between drain and source – will be open circuit; the gate to drain and maybe gate to source probably short circuit. The intrinsic diode S-D is probably also open circuit and you casually measure this with a diode tester from source to drain. High grade High quality best finishing shiny four layer’s PCB. Plus components to assemble 5 boards, all original genuine direct from factory. Best genuine IRF MOSFETS ultra low resistence very high current. Could you give some information about regenerative brake system? The energy goes inside the input capacitor (connected to the battery pack)? I suppose that this break system could be adapted (limitation of negative acceleration for don’t block the wheel connected to the motor)? Is it directly use when the quick command is bellow than the current speed? I want to use this ESC for a 4-wheels driven mountain-board (BLDC sensorless). With an other electronic board connect with CAN-bus to the 4 VESC, I will add some CAN command for ask temperatures, battery voltage, tachometer data, and set parameter as direction control. Maybe I will try to apply the parameter of one VESC (read by my electronic board over CAN) to the other VESC (transmit with CAN). I’d appreciate it if you could point me the direction of some source code or similar that would have the communication specs defined. Did you ever figure this out? I have a similar application. I’m having an issue that I’m hoping you can shine some light on. When I check the motor driver datasheet (DRV8302), I noticed that the fault pin needs to be pulled up. My PCB version 4.11 and isn’t pulled up. I have a little problem at controlling the VESC with an tennsy 3.1. I use the PPM input and the current control because I need the direction of the motor changed as fast as possible and PPM is the simplest way to control a ESC. As PPM signal I tried to send an standard PPM Signal from 1ms to 2ms @50Hz and the zero point @1.5ms. But the motors keep spinning at startup with the Firmware 1.12 and the actual GIT firmware (both tested) with hardware 4.7. I figured out that the zero Point (no motor spinning) is at 1.455ms instead of 1.5ms. In the BLDC-tool only the min and max PPM signal length could be adjusted (these are on mine BLDC 1ms and 2ms). I would suggest, that the zero PPM signal length could be adjusted also. I hope this is possible to integrate. I just wanna ask if you maybe know what dead time do you use on PWMs? I am building similar ESC, and I have really big dead times, like 800ns. What are yours, do you have it somewhere in the code? HI Benjamin, Is the 3 pin ppm connector for both servo ppm signals input as well as output, ie it can be used to read in a ppm input or send out a ppm output? it seems its just connected to PB5 which is just a GPIO so it can be configured as input or output. Right? Yes, you can use it for both. You have to enable servo output in conf_general.h and remove the low pass filter to use it as output. Based on your design I have developed a slightly modified controller that i want to share with you. It uses 2 doublelayer PCBs connected by a 30pin 0.8 pitch Board2Board connector separating MOSFET’s and controller. I wanted to have an upgradeable FET stage and allowing easier cooling by positioning the FETs at the same component side. The design is based on the F405RG and the DRV8301. I interchanged TIM1 and TIM8 and the respective PWM outputs to support an optional secondary CAN-interface (for redundancy issues). For SW-development (most of it is trying to understand/adapt code) i use CooCox and J-Link. Thank you for sharing all of your work with us Benjamin ! I’m quite new in all of that and the design is not fully tested/functional yet but will keep you informed. Hey this is interesting do you have the schematics/layout files or any more info on this – did it work? nice work, I really got some inspirations from your project. One thing I don’t get till now in the H-bridge part: why is resistor R36 connected to the source of Q2 and not to the source of Q4? Has it something to do with the current measurement in the half-bridge for phase 1 and 3? Wouldn’t it be better to have a “symmetric” design for each half bridge? Maybe you can enlighten me. Could I get Gerber file? Is there any test tool for MS? link is not working~! Hi, there is a new released DRV8305-Q1 it would be a nice improvment on this board. It allready has current sense amplifiers, more EMI protection and SPI interface. Also can go up 150degrees operation and automotive rating. I click the start detection.but in the right it tells that bad detection reslut receive. what wrong with bad detection reslut receive? Why I can not download the schematic of complete I’m really really to make a ESC of 32bit with supporting CAN bus and something else!!!!!! THANK YOU!!!!!! does your esc load up batterie if the motors go into generator mode (easy said if you brake)? Hi, I am currently working on a regenerative application which utilizes a 1KW BLDC motor rated at 48V. I intend to connect a 48v Lithium-ion based 48v 15Ah battery. Can I know how the board convert the BEMF to usable energy and is it able to regenarate at all speeds of the motor? Does it cut off when the speed is low? And does the regen have any negative effects on the battery? Thanks for your time and patience to read my query. First of all, this whole project is really amazing ! Thank you so much for sharing this with us! As always thank you very much for sharing your amazing work ! We need to run with duty cycle no reverse mode for our multirotor UAV project, in order to get fastest dynamic response possible. We noticed that this mode has brake turned on, perhaps as a result the motor gets hot with loss of energy efficiency. we also get squeaking sound when turning throttle up and down very fast. Sometimes on startup the motor runs in reverse direction as well. We noticed that when run with a motor designed for FOC, the performance is very good. 1. how do I turn off brake in duty cycle modes ? 2. is it necessary to use only PSMS motor designed for sinusoidal control ? 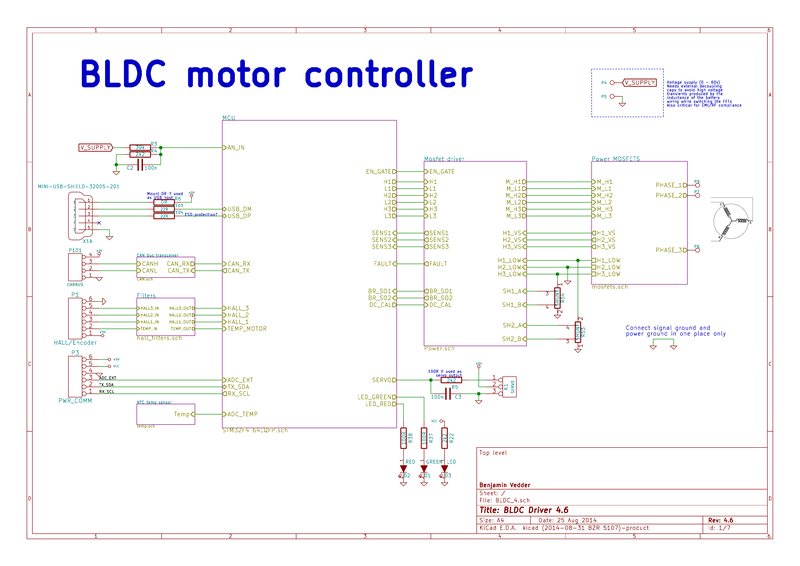 we tried BLDC control for our motors, without much improvement. I’m located in Germany and can Repair VESC from all over Europe. 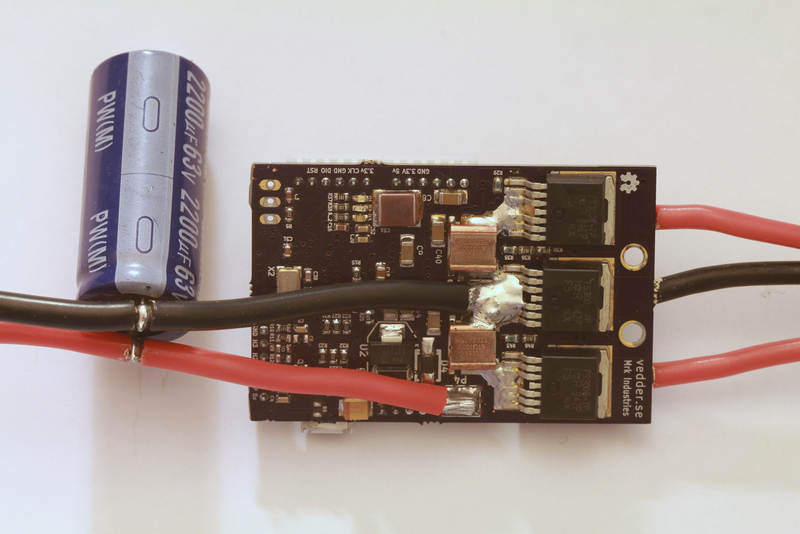 To what extent is the current VESC board design ready for energy recuperation by means of a supercapacitor? That is, to deal with higher frequencies of acceleration/deceleration cycles than what is best/possible for the batteries. especially these commands don’t work. any update to the tutorial? Is there any news about motor temperature monitoring. I am going to run it on e-bike mid motor, with integrated temperature sensor in the stator?